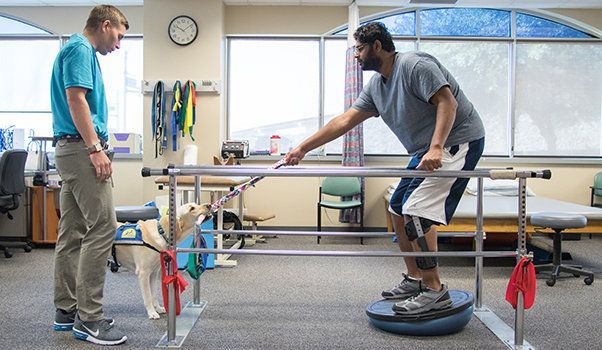 Canine Companions Facility Dog Karmen is a 2-year-old Labrador/Golden Retriever cross who assists in the outpatient clinic with her human handler, Travis. Travis, a physical therapist at the facility, says Karmen has completely transformed his sessions. “Karmen is already a great addition to our outpatient clinic and has noticeably changed how most patients feel about attending physical therapy sessions." Karmen was one of over 400 dogs placed free of charge in 2017 to increase independence for people with disabilities! Read more about how Karmen is changing normal exercises into something patients look forward to. What better way to learn the ropes of being an assistance dog then by spending time with one? Read Canine Companions puppy Able's most recent blog post about his big sister, Service Dog Kary. 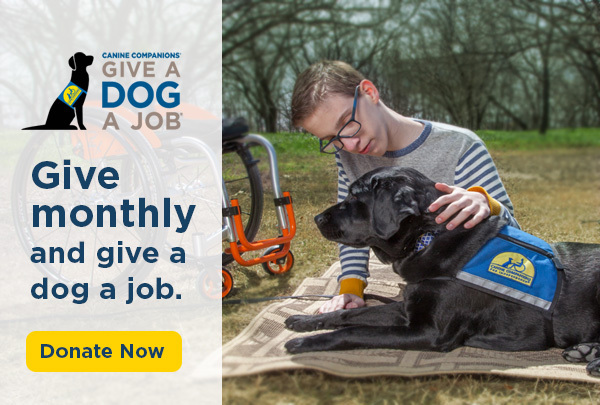 Achieve a unique, challenging and fulfilling career as an assistance dog trainer through specialized career development and discover the leader in you. Learn more at cci.org/instructor. Find out how you can leave a lasting impact to Give a Dog a Job, and let us help you meet your goals. Learn about the best assets to make a planned gift, how to give and more. 20% off select fleeces and hoodies in Canine Companions' gift shop through 1/31/18. Last chance to order your 2018 puppy calendar! Make the resolution to change someone's life, and raise a puppy! See our mission in action and join us for a graduation.